A full-time travel writer since 2003, Regis has written dozens of travel guides to far-flung destinations around the globe. His writing has brought him to many parts of South America, as well as Southern Europe, West Africa, Southeast Asia and Australia. He sees travel as a powerful tool in building a more enlightened and tolerant society. "When I first started out as a travel writer, I tended to cover mostly Latin America. These days, my pursuits are literally all over the map, and I've written about everything from indigenous festivals in Papua New Guinea to the best pintxos bars in the Basque Country. " "I discovered a love of languages and foreign cultures at a young age and spent my formative years learning Russian, Spanish, French and Portuguese. 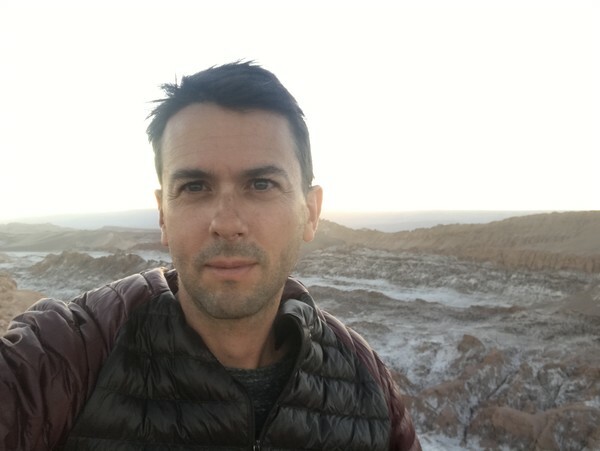 After a life-changing trip to the Andes in 1999, I came home, sold hold all my belongings and spent the next half year traveling around Latin America. When I returned to the US, I began writing about my experiences and ultimately found my way into a job writing travel guides full time. " "While exploring southern Vietnam, I took one day to motorbike along a lovely but totally empty stretch of road between Vung Tau and Ho Coc. I was at least 10 km from the nearest town and an hour's ride from my hotel when my bike sputtered and died. It was late in the day and the sun was setting. After a few moments of feeling sorry for myself and some fruitless tinkering with the silent engine, I began pushing the bike. I covered about 500 meters when a young couple pulled up next to me and offered help. Although the two spoke little English, the man explained that he would push me — his foot against the back peg of my bike as he drove along, the two of us balanced closely together. He guided me to a shop of his friend, who was unable to fix it, and then he insisted on pushing me the rest of the way to Vung Tau. When we finally arrived, in darkness after a rather gruelling journey, he refused any payment. Instead he invited me out for a drink, and even then he wouldn't let me pay. It was a humbling encounter, meeting such a generous soul who was willing to put himself out for a stranger. It's just one of the reasons why travelling in Vietnam is so rewarding: it's less about seeing the sights than mingling with a truly great people." A magnet for nature lovers, Chile has a little of everything, from ice-capped volcanoes to lush rain forests. The diversity of its landscapes and vast size offer limitless adventures: trekking past glaciers and soaring Patagonian peaks, watching sunsets over otherworldly desert valleys, and basking in mountain hot springs or on a white-sand beach after long days of exploring. The following is a list of the country’s top 10 regions to visit when traveling one of the world’s longest countries. Home to Andean peaks, dramatic coastlines and otherworldly deserts, Chile has an astonishing variety of landscapes that set the scene for unforgettable adventures. You can trek through Patagonian wilderness in the deep south or buzzing beach towns in the north. In between, you’ll find award-winning wineries, art-filled bohemian enclaves and impossibly picturesque valleys, not to mention one of South America’s most dynamic cities. The biggest challenge is deciding where to begin. Stretching for more than 2600 miles along the western side of South America, Chile is a narrow country of dramatic extremes. You’ll find bone dry deserts in the north, glacial fields in the south, and lush valleys, smoldering volcanoes and enchanting beaches in between. With its diversity of geography and climates, Chile offers year-round appeal, from skiing in winter to trekking and beach-hopping in summer. Home to red-rock deserts, craggy mountain peaks and sparkling coastlines, northern Chile offers boundless adventures for avid travelers. You can spend your days wandering through eerie ghost towns, zipping down sand dunes or basking on pristine beaches, followed by nights of stargazing beneath the dark southern hemisphere skies. Here are some of the top destinations when planning a trip through Chile.